Step 1 Place the chiles in a large bowl and cover with boiling water. Let rest until softened, about 30 minutes. Drain, then remove the seeds and stems from the chiles. Wear latex or rubber gloves when you do this to avoid irritating your skin. Step 2 Place the seeded and stemmed chiles into the bowl of a food processor with the garlic and pulse a couple of times. Add the salt, caraway and coriander. Process until smooth, pouring the olive oil into the feeding tube on top as you blend. Add a little water if necessary to achieve the right consistency: The harissa should be a thick paste. To store, top off with a thin layer of olive oil and refrigerate. In Recipes-list.com we have selected the most viewed recipes from category - Sauces and condiments Vegetarian . Enjoy the best recipes specially selected for you! 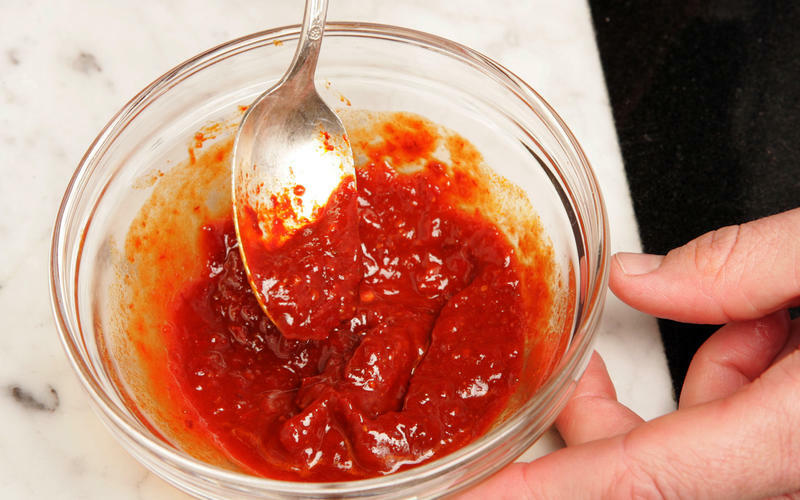 Basic harissa is the right choice that will satisfy all your claims.